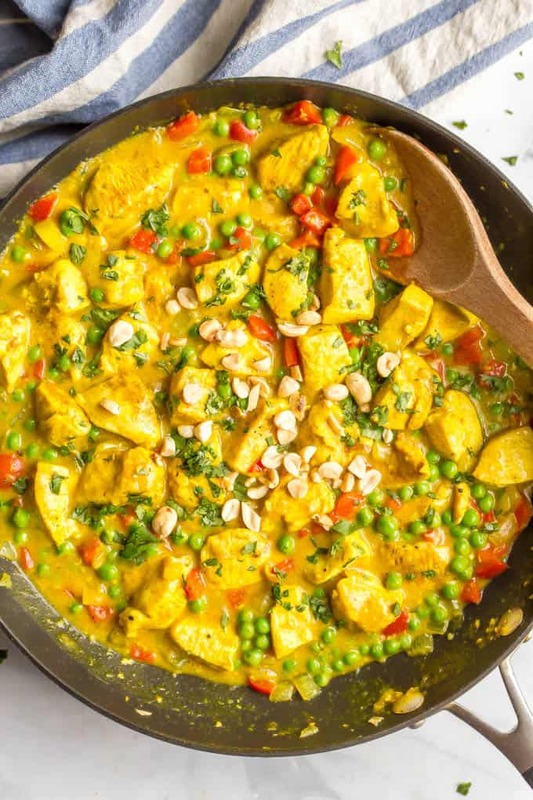 This quick and easy coconut chicken curry features colorful veggies and coconut milk for a creamy curry that’s packed with flavor. 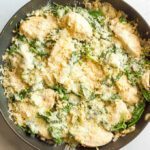 Pair with brown rice or cauliflower rice for a fast weeknight dinner! Hi there and happy new week! Did you have a fun weekend? Did you celebrate St. Patrick’s Day? We were at a party all afternoon with some friends – the husband brews beer and made some reuben fixings, the wife recently had their first baby that we got to visit (he’s named Brewer – how cute is that?!) and we all hung out and let the kids run around while we chatted. Super fun! Sunday was a clean-out-the-garage and run errands and do laundry type of morning, but then we kicked back in the afternoon to watch basketball. 🏀March Madness is always fun for that! 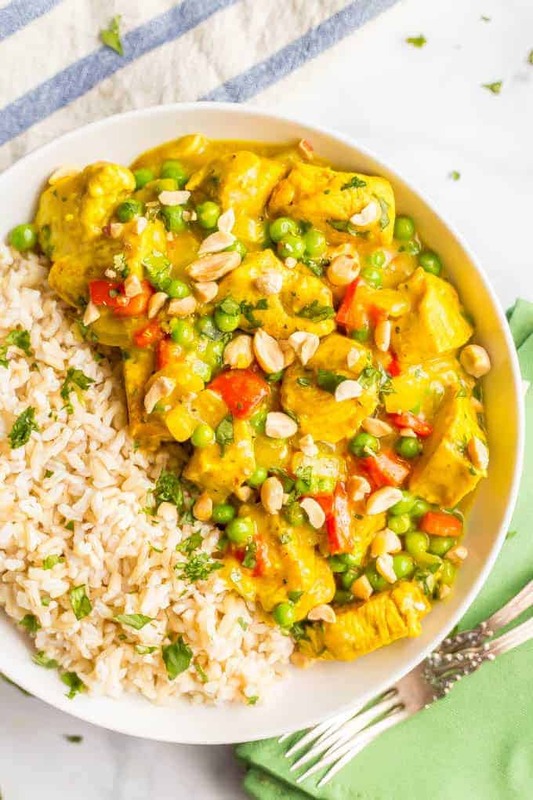 Today’s 20-minute coconut chicken curry recipe is a slightly different spin on my quick chicken curry, which is one of our favorites! 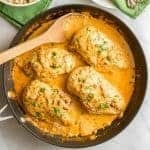 I use coconut oil and canned coconut milk to make a creamy version of curry, instead of a tomato-based one. And I use a red bell pepper and green peas to add some veggies and freshness to this. We usually serve it over steamed brown rice for a full meal but you could also sub cauliflower rice for a low-carb option. 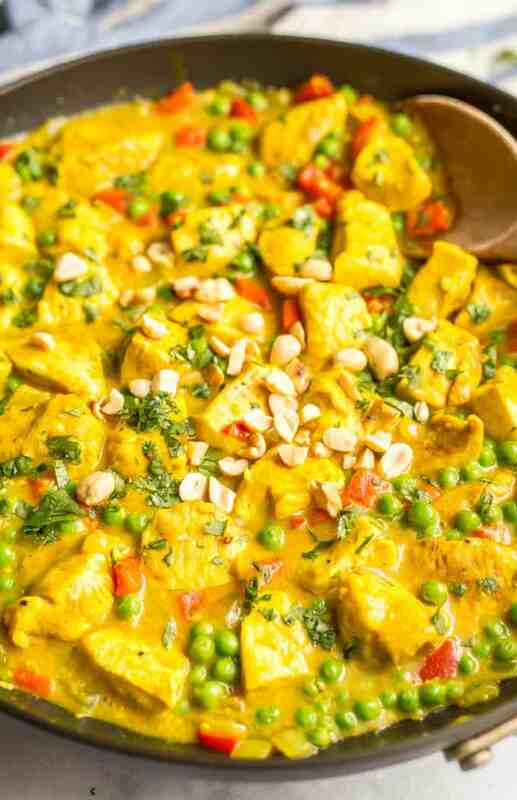 I love serving this with peanuts and cilantro for great texture and a pop of freshness. You could omit the nuts or substitute cashews and use parsley, if desired. 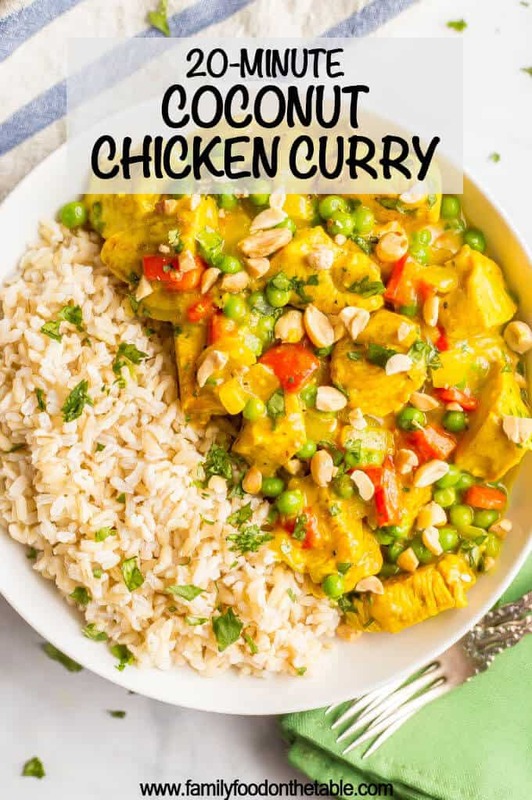 I usually serve this over steamed brown rice, but basmati rice would be great too (and we love the brown basmati rice). Or use cauliflower rice for more veggies and a low-carb dinner! 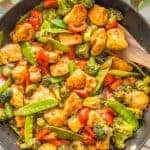 You could spice this up by adding some red pepper flakes or cayenne pepper with the other spices or by serving it with some sriracha sauce drizzled on top. Not a fan of peas? You can substitute fresh spinach if you’d like. Add it when the chicken is nearly cooked through and stir until it’s just wilted. Hope you have a wonderful week my friends! 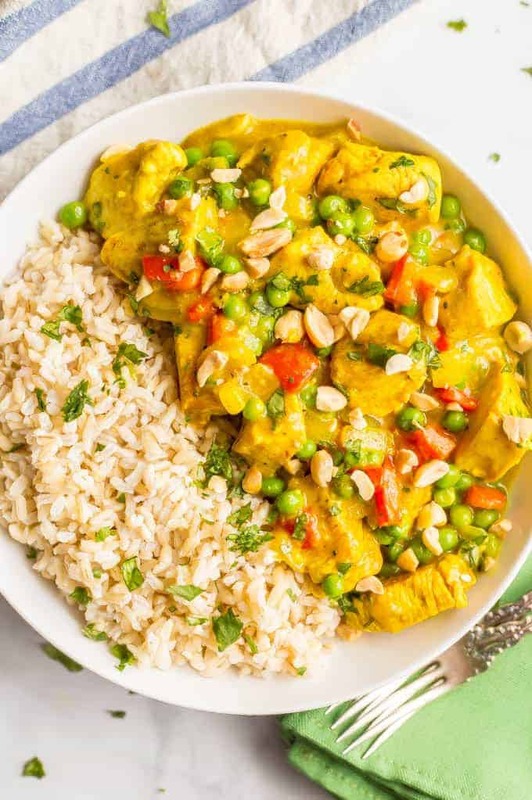 This quick and easy coconut chicken curry features colorful veggies and coconut milk for a creamy, flavorful curry dinner! Add onion and red pepper and sauté until tender, 4-5 minutes. Add garlic and sauté an additional 30 seconds. Add chicken and sprinkle the seasonings over the entire pan. 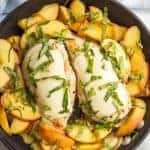 Cook chicken 2-3 minute in pan. Add coconut milk and ginger and bring to a simmer. Reduce heat to medium and let simmer for 6-8 minutes, until chicken is cooked through. Place cornstarch in a small bowl and add about 3 tablespoons of liquid from the pan. Stir well with a spoon then transfer the mixture to the pan and stir well to help the sauce thicken. Stir in the peas and simmer for 1-2 more minutes, until warmed through. 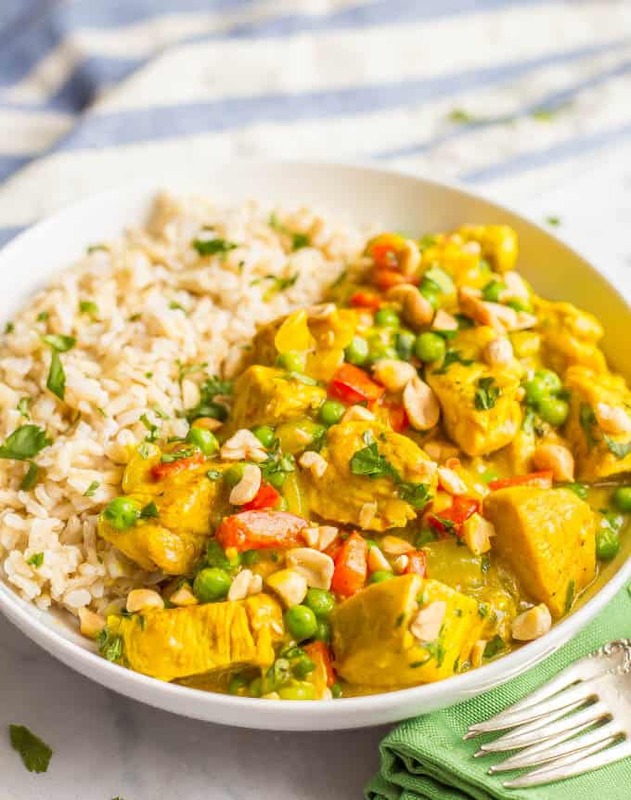 Serve curry hot over rice and top with chopped peanuts and cilantro. 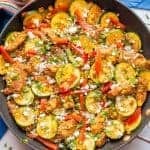 You could spice this up by adding some red pepper flakes or cayenne pepper with the other spices or by serving it with some sriracha sauce drizzled on. Not a fan of peas? You could substitute spinach if you’d like. Add it when the chicken is nearly cooked through and stir until just wilted. This looks like comfort food perfection! Thanks! It’s great for a quick and cozy meal! Love how quick and easy this is! Perfect for a busy weeknight dinner! Thanks Lindsay! 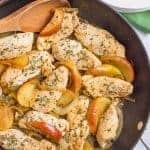 It’s definitely a great weeknight dinner option! I love this! Packed full of amazing flavors! This was good, I did have to make some adjustments. It was a bit bland when I followed the recipe exactly, so I doubled the spices and added red pepper flakes for a kick. Next time I don’t think I’ll add the cornstarch, I like Thai curry to be a bit more runny. Those sound like great additions! And yes, feel free to skip the cornstarch if you want it more liquidy.